I've been dying to do my nails for a couple of days. I had CND Shellac in Masquerade and the new Lecente Fireworks Glitter in Flame on if you remember but my nails were starting to get a little battered and so I was overdue a change! 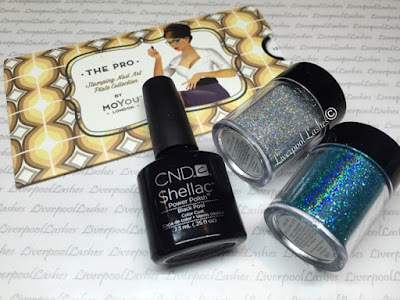 Since I'm going to Corfu tomorrow afternoon I figured that I wanted something that was sparkly and eye catching so it didn't take too much thought before I decided on two of the new Lecente glitters in Spark and Turquoise Holographic along with some stamping over it. I applied two coats of CND Shellac in Black Pool and cured them. 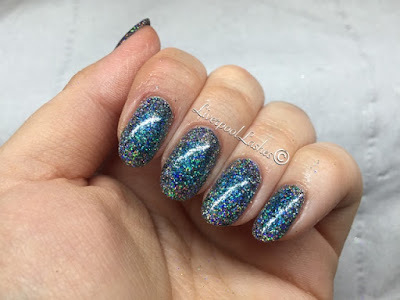 Next I took Lecente Turquoise Holographic Glitter into the centre of each nail and then applied Lecente Spark from the Firework Collection around it and top coated it. 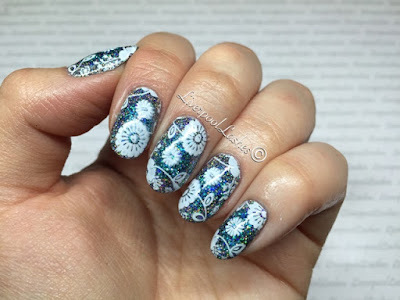 I then stamped MoYou London Pro Collection Plate 13 over my nails using Konad Special Polish over it.